Ludainterio OpenCart Template will serve as a great setting for decor items, interior products, and furniture. Ludainterio Opencart theme features clean responsive layouts, premade pages, footers, and headers. Every element can be tweaked in the live builder to fit your expectations. Multiple widgets, plugins and visual effects help to make a lasting impression on every customer. The theme is SEO-optimized and light-weight. If you want even more traffic, start a business blog and make use of the many post options available in this template. 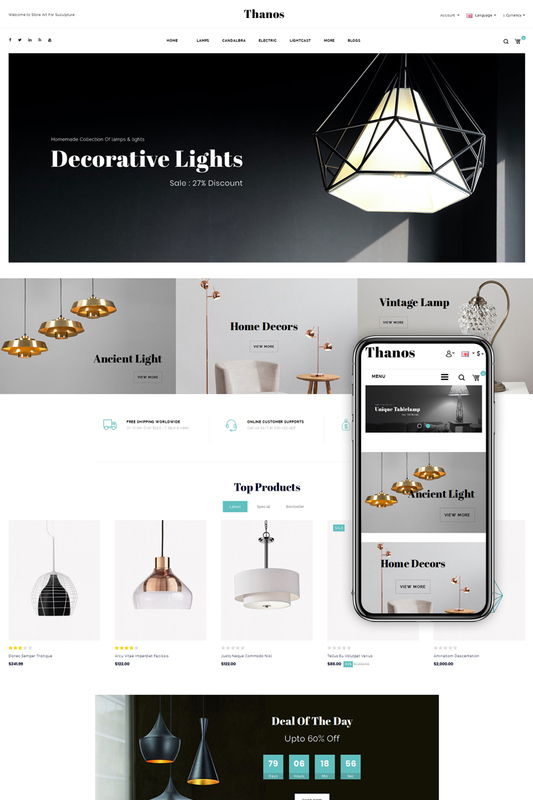 Home & Furniture – Interior Responsive Opencart Theme is built up as an ultra-premium and unique store of furniture and home decor that promises users an absolute satisfaction of outstanding features integrated. The Opencart based creation provides this theme an eye-catching appearance with reasonably designed layouts and the new module boss that offers a mega menu as well as revolution slider. Besides, it also brings shoppers the amazing blocs for featured product. Empire-Opencart Theme is a Responsive Shop theme specially designed for fashion designer, clothes, furniture, jewellery, beauty and cosmetic stores. Empire Shop Theme is very nice with its clean and professional look. eStore OpenCart Responsive Theme is a modern furniture Opencart Theme designed and crafted specifically for an online store selling exterior furniture, decorations, supplies or other products you want to sell. Estore theme with prevailing colors are blue and white that makes the layout elegant. By means of a mega menu, you can easily create complex menus with multi-level layouts and a drop-down menu with a banner. Slider images are supplied with descriptions. Banners advertise the best solutions for furniture which immediately focuses customer’s attention. StoreFlex – Responsive Multipurpose OpenCart Template features a clean, minimalist flat design that will match some business niches. The layout is spacious enough to locate different pieces of content in a quick-to-scan manner. It will work well for presenting content-heavy online projects. Every element of the theme’s design serves the primary goal of bringing the store’s items in the spotlight. If you sell wrapping materials, you definitely need a corporate website to promote your products on the local and international markets. Our template is clean, serious and trustworthy enough to create a solid image of your company. Violet text looks clearly legible over the white background. All products have star rating and detailed descriptions, so your customers will be able to get full information about the item before making a purchase. Banners are simple and don’t contain any images, just plain text, to keep the design uncluttered. They draw users’ attention with the help of large fonts.